It’s been years and years since I read a Shakespeare play – last time would probably have been for a course I did in college. However I have been very slowly building up my collection of them and keep meaning to pick it up again. As I finished a book the night before Shakespeare’s birthday, I thought what better time to start reading his plays again? 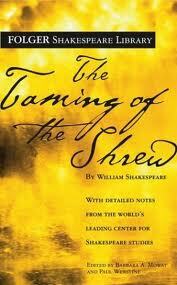 I chose The Taming of the Shrew for a couple of reasons. 2) it’s the play that 10 Things I Hate About You is based on…….ok those 2 reasons may be actually one and the same reason, but still! So, there are 2 sisters, Katherina and Bianca Minola, both beautiful, but while Bianca is kind and sweet and caring – Katherina is described as a Shrew – in other words, loud and aggressive and generally disagreeable. Bianca has many suitors but their father wishes for the elder sister Kate to be married off first. Lucentio decides to disguise himself as a music tutor to get closer to Bianca, and he and some others hire Petruchio to woo Kate. Petruchio is looking for a rich wife with a big dowery and Kate is exactly what he wants, he doesn’t seem to care about her temperament in the slightest. To complicate things even more, Lucentio’s servant Tranio must pretend to be Lucentio as he is expected to be there, and this will also distract Baptista from Lucentio’s tutoring. leading apes in hell was an unfortunate fate for spinsters in those days or so I found out and Katherina had at this moment realised that Bianca was his favourite, and the one he wanted to see married. However once I got about halfway through, I realised I had slipped back into the lingo, and was mostly able to make my way through – while not understanding everything exactly – I was able to grab the jist of the meanings of sentences and understand and enjoy it quite well on my own. As much as I enjoyed reading this there was one big aspect which made me raise my eyebrows a touch. Kate is the epitomy of everything a man should not desire, apparently. She speaks her mind, she has no interest in marriage or suitors, and she has little good to say about anyone. Then along comes Petruchio, now we know that all he is looking for is a rich wife, and when he hears about Bianca’s suitors proposition to pay him to wed her, nothing can dissuade him from meeting her. Even when they meet, he seems to be able to ignore everything bad about her and turn it to good, but all the while, you suspect that it is just the money he is after. This is bad enough I suppose, but I could overlook this small indiscretion, however, it soon becomes clear that not only will Petruchio force her to marry him – through persuasion only I should add – but he also wants to drastically change her character. To do this, he must make her obey him in everything. And so he starts playing a game with her, a game which involves starving her of proper food until she succumbs to his “rule”, and also plays severe mind games with her. For example he tells her the moon is looking very bright, and when she disagrees and says that it is not the moon it is the sun, he will not relent until she agrees with him and consents that yes it is the moon. At this point he basically makes little of her to everyone and laughs at how she could think it was the moon when clearly it is the middle of the day. Now while I can easily explain this away, the time it was written and also the fact that this part is supposed to add comedy to the play, it did make me a little uncomfortable at times. Having said that, I suppose, if the Shrew wasn’t tamed during the play then really it should have been named something else!!! One last final note, as unfortunately I find it hard to not talk about Ten Things I Hate About You in the normal course of the day, let alone when I’m discussing The Taming of the Shrew, I must mention briefly the film. I have loved the film for years, ever since I fell in love with Heath Ledger, who does a brilliant but less misogynistic version of Petruchio and now that I have finally read the play, I must compliment the screen writers for bringing a very modern but yet quite true interpretation to our screens. All that is good about the play is brought to life, Kat luckily retains her strength and ambition in the film but I could identify the characters perfectly while reading. I would recommend The Taming of the Shrew if you are new to Shakespeare and especially if you know the story from the film. If you haven’t seen Ten Things I Hate About You, then shame on you, go read it, then watch it, then read it again… then watch it again, just cos Heath is beautiful. Listen to the LeedsBookClub soundtrack on Spotify here! And a few You-Tube videos here!